Are you missing the fact that you need solid infrastructure to spur new pedestrian oriented development? You're living in the PAST and in the NOW. You have to plan for growth and density for the FUTURE. My goodness, you can't be this pessimistic. That is honestly the issue with how this city has dealt with growth. It's that mentality of "Oh well nobody is going to use it." that has stalled progress. Idc if you worked on Post Oak for the past 30 years. If you give people an option to walk, THEY WILL DO IT! If you need any proof of this then look at damn near every other city in the entire world. You can stay stuck in your car for all I care. Vy, would you consider the Galleria a "major draw"? Are you missing the fact that you need solid infrastructure to spur new pedestrian oriented development. You're living in the PAST and in the NOW. You have to plan for growth and density. My goodness, you can't be this pessimistic. That is honestly the issue with how this city has dealt with growth. It's that mentality of "Oh well nobody is going to use it." that has stalled progress. Idc if you worked on Post Oak for the past 30 years. If you give people an option to walk, THEY WILL DO IT! If you need any proof of this then look at damn near every other city in the entire world. Again, we're talking past each other. I'm not suggesting infrastructure is not important. What I am suggesting is that putting a bus and some trees is not going to magically inspire people to take a strole on "the boulevard," considering it's filled with the likes of Gallery Furniture and Luby's. People already walk up and down Post Oak everyday. Can you point me to any evidence that suggests putting in some more sidewalk or a bus line will spur urban development here or is some kind of missing link between the status quo and said urban development? What specifically do you anticipate being developed/built as a result of this project? Connecting the two transit centers, as discussed before. Allowing people to go to the Galleria via those transit centers easily, where before it would have been more difficult. Encouraging visitors to the Galleria to venture up and down Post Oak, where before they'd have to spend time finding a parking spot and driving in traffic. It makes the whole strip an extension of the Galleria, more so than it is now. Also, during rush hour these buses will almost certainly be substantially faster than driving, and there people who live along this corridor. Even if they don't walk except from the station to their destination, it will be a tempting alternative to sitting in traffic. Or at least, it would be for me. I’m impressed by METRo/TxDOT’s hard work in connecting the galleria to more parking lots via bus. The intersection of POB and San Felipe is less than a mile from the mall. Is that half mile distance currently discouraging urban development? Can people not walk to CPK or the Verizon store currently? The “boulevard” already is an extension of the Galleria and yet there’s none of the development being claimed in this thread. It’s specious to think a bus and some trees will transform the strip malls and Starbucks into something else. I think that it is very safe to assume that the lives of the remaining strip malls, fronting POB was very limited already. The BRT will certainly expedite the transition. Is it? I wonder where your optimism comes from? It comes from an overall trend in development not just in this city but across the country. I mean it's pretty obvious. The fact you minimize the impact of "sidewalks and trees lining a boulevard" says enough. Those very specific features is what draws developers to build with no setbacks. They look at it as an opportunity for not just motorists but those walking and taking transit as an opportunity to better their business. Again I don't know what else to say but look at other cities. I discount trees and sidewalks because this is Houston, not the rest of the country. This is a suburban, sun belt city. That is it’s DNA. That I’ve been told one of the advantages to the bus is easier parking underscrores that fact. What evidence specific to Houston that supports your that sidewalk and trees will spearhead urban renewal? Why isn’t Apache building its new HQ? Vy, my optimism comes from what I have witnessed in this city and in this general area in the city. Look at the area just East of the West Loop, between San Filipe and Westheimer. Within just a few years, it has transitioned from low density apartment communities, to high rise, high density towers and up scale high density shopping/Mixed use areas. All of these come along with off-street parking structures. Also, look at BLVD Place right on the BRT line...more Density, with multi level commercial/retail buildings and high rise apartment buildings, with more garage parking. Low density retail, is giving way to more high-rise residential structures, at San Filipe. Those large parking lots, just will no longer make sense...they probably don't now. With more people along the street and on the sidewalks, retailers and other commercial enterprises, will find it to their advantage to have their front doors where the people are and put the cars in the back/under or over. There are also more hotels proposed for 'the boulevard'. Next, imagine a high speed rail station adjacent to the NW transit center and terminus for the BRT Line. Sure Hit! Appreciate the response. And, I agree that there has been development on the east side of 610, and it's a welcome sign. That said, I don't see how you can extrapolate that development to POB. For starters, they're divided by 610. I don't see people walking from the ROD under the highway, through some commercial office buildings, just to take a bus to go to a mall. If the BRT system included a stop at the ROD, I'd be able to muster some enthusiasm for it. The Galleria has been a major draw for decades. Yet those shopping plazas have remained. You still have large, empty parcels along POB, San Felipe, and on the interior. The market hasn't moved to prod development in those places - and suggesting that trees + sidewalk is the lacking catalyst doesn't pass the straight-face test. Will the area change over the course of decades? Maybe. But to suggest that anything is imminent (i.e., within the next couple years) is beyond optimistic in my book. That's fine, walkability is a major component. Yeah the lack of solid infrastructure is the failing component. You continue to ignore the small details that make a city great and more desirable to pedestrians, transit riders, and motorists. The market hasn't moved because those areas haven't maximized their potential for development. In other words, if the city encourages sprawling growth, then developers will follow because the end game is making money. However if you direct and guide development, then you change that mindset. Idk why that's so difficult to understand. My point isn't sidewalks and trees, it's guided infrastructure for strong development/redevelopment. AGAIN look at other cities. If the city encourages sprawling growth, then developers will follow because the end game is making money. However if you direct and guide development, then you change that mindset. 100% agree with this. The problem is that there's no zoning here. There aren't restrictions in when/how developers develop land. That is far more for accomplishing an urban/pedestrian environment than a bus and some trees. Again, look at other cities (Austin would be a great example). AND Vy ignores the extent to which the market has already moved... BLVD Place for example. Also, The shopping center across POB from BLVD Place seriously considered a more dense redevelopment several years ago, but decided the time wasn't quite right. They made it clear that such a redevelopment is likely to happen in the future. "Vy, my optimism comes from what I have witnessed in this city and in this general area in the city. Look at the area just East of the West Loop, between San Filipe and Westheimer. Within just a few years, it has transitioned from low density apartment communities ..."
That's what I was responding to. Austin is a sprawling city other than their downtown. You kinda missed the point. 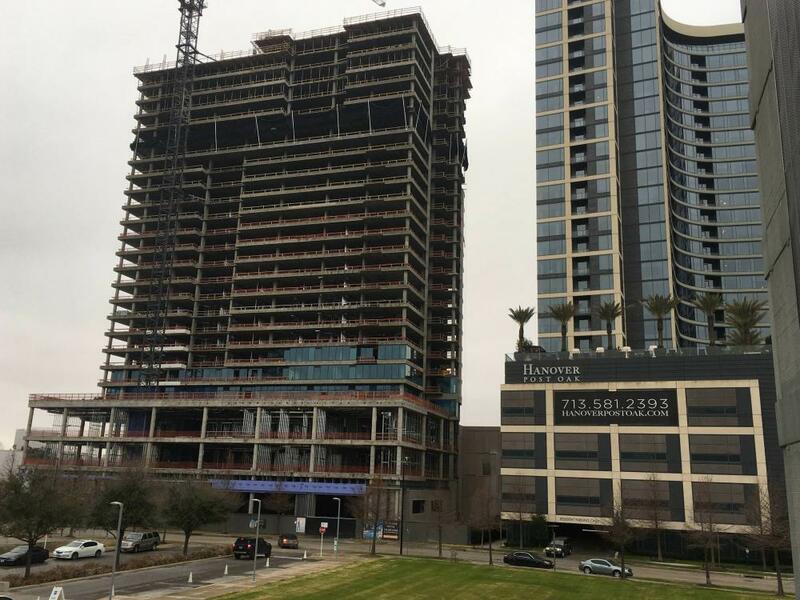 Would you consider Austin a city with a high amount of regulations on real estate development? No just not enough incentive yet. Which AGAIN is my point. I'll bet that development picks up on those lots once the BRT is finished. So bus + sidewalk is the missing link to development of those pieces of land? Others suggested that the market had already moved on the area. Pick a lane: either the area is moving (so why several empty tracts) or its not (but will be once we get some more sidewalk put in). No it's actually pretty loose. Austin is sprawling more than ever. It's downtown is growing denser but that's just the overall product of people moving to the city and developers taking advantage of it. That's a city WITH zoning. Again zoning has nothing to do with just having good infrastructure. You don't need to be zoned to accept that concept. Zoning also fails in some areas to create strong urbanism. This is getting to be besides the point, but would Austin have the highly dense downtown it enjoys without zoning? It is moving. I made that clear. Developers aren't going to budge on something that won't make them money. Is that so hard to understand? If the city doesn't provide a strong incentive then why should a developer build just to build? Empty lots have nothing to do with this. Didn't answer my question: are the bus + trees the only thing keeping the strip plazas and empty lots from being (re)developed? You and I have very different takes on what constitutes a "strong incentive"
True, the suburban sprawl from downtown to Tomball clearly shows a strong desire to live in/near the city of Houston. Then you tell me what you think a strong incentive is??? For Houston, not anywhere else. The only thing you've done is argued every point and you haven't provided anything. Other than the fact you worked on Post Oak for 2 years. The example of the development East of 610, is proof about how real estate in the area is becoming more dense, not as a reason for the BRT line. Certainly, POB and ROD and surrounding areas, are poorly linked and isolated from one another. It's a Comp. BLVD place is attached to many of the vacant lots that you are referencing. I would suggest that this is the best example of how the area is already densifying. The Very Large building, where Whole Foods is, one large apartment tower developed by Hanover, a second being built, another sister building similar to the Whole Foods Building will be on its way soon. Pretty remarkable density and redevelopment. What was here before? Strip mall. Why isn’t Apache building its new HQ? Seriously? I am not sure I know what you mean by the example. Have you been paying attention to what has happened to their business in the last few years? Building a new building just doesn't make sense. But, they have held on to the property, i believe. They see its advantages. This project is another step in support of the long term vision of creating a dense pedestrian-friendly environment. Contrary to the dishonest suggestion above, no one has said it will cause imminent (within 2-3 years) redevelopment all along the boulevard. Again, it's part of a vision for the long term. Contrary to the repeated dishonest attempts to diminish the project by referring to it as "buses and trees", the project consists of more than that: wider sidewalks, more shade, better lighting, better landscaping and art. And as everyone here surely knows, the buses are not just standard buses. Eaxctly! Why is this person diminishing this project? It really screams an old Houston mentality. I don't think you can say that the presence of multiple empty lots - that have been empty for years - is a sign of a densification. I only know of the one tower being built by Hanover (to the extent that you're suggesting that there are two being built). As for other's "on the way," I'll believe it when I see it because a lot of what I see out there is empty land. As for Apache, their Alpine play is poised to be highly lucrative. That, along with the rise/recovery of oil makes the renewal of their POC lease (as opposed to starting their building) kinda prove my point. Because adding trees and a bus doesn't do much of anything. I would love to see this city become more urban and dense, but expanding a sidewalk isn't going to do it. A lot more drastic alternatives - which likely aren't feasible - are needed. So I'm sorry to burst your bubble on a pretty pathetic project. So you want Houston to become more urban and dense but you want to diminish the small efforts it takes to become that. Real smarty guy... NEXT! Read more. Type less. Hanover is currently building their second tower, as Naviguesor said. The first one is right next door. Are you in Chicago by any chance? Maybe you can elaborate what was dishonest about my suggestion when the conversation was about how much the area has changed in "just a few years?" You can take the long look all you like. In 3 decades, I'm sure the area will have developed. That's besides the point. Claiming some *really fancy* buses will trigger development in the area is laughable. It's great everyone is so excited about an otherwise marginal project, but don't act like market movement is hinging on some trees being planted. As I said earlier, read more. Type less. Naviguessor did not say two were being built. You would be wise to take your own advice. I didn't know commenting on some buses would ruffle these many feathers. I respect your opinion and energy against this project, but Apache renewing their lease and deciding to not commit to a 300m+ project, does not prove your point. The wider sidewalks and trees will encourage developers to incorporate GFR or more of a 'Street Presence' in their projects that front Post Oak Boulevard. I've certainly utilized it a lot more to walk to BLVD Place or Uptown Park for lunch, now that these sections of sidewalks are opening up. As a current office employee and former resident of the area, it definitely has my approval. V as in Vik, right? The troll formally known as Slick Vik strikes again. Did you ever go out for lunch, or did you always bring it with you when you worked at 2POC? If I worked there I'd probably always bring my lunch, driving around that area at lunch is as painful as pulling teeth. But, maybe if you could walk to a station, hop on a reliably timed BRT bus and get to the food court in the galleria in a timely fashion, your lunch universe expands a bit. But hey, you're probably right. worthless. Imagine all those people living up and down this boulevard in those tall condos I'm sure you saw while you were looking at Post Oak. You honestly can't see them hopping on a BRT to get to whole foods to grab dinner and a bottle of wine for the night? no, I'm sure of it, you're right. it's worthless, all that's really going to happen is that people are going to drive in from the suburbs trying to get to gallery furniture and be frustrated by the trees. without a hint of sarcasm, I can honestly say that the biggest problem with this BRT is eventually going to be parking. in that people are going to drive in from the burbs, park their car at uptown park where they will grab lunch and a starbucks, then hop on the BRT to go wandering in the galleria, only to return to an empty space because their car was towed. Jim McIngvale fought this and is probably still pissed about it. He knows his rent is going to go up in a few years specifically because of this update to the street and he won't be able to afford to have his showroom of uninspired, expensive, overstuffed leather at the corner of PO and Westheimer. Honestly, every time I am in the area and drive by that oversized strip center at the corner of PO and Westheimer, I wonder how long that place (and others like it in the area) can hold on before it is ripped out for a higher purpose. I walked to and got something from WF literally 90% of the time I worked there. Shockingly, the quarter mile or so didn't kill me and I didn't need the assistance of a bus. But apparently all those people living in all those high rises are unable to walk a half mile or so, so giving them a glorified trolley will be totally necessary. Wouldn't Uptown TIRZ using the millions of dollars it spent on some trees better be used as subsidies to developers who'd demolish/develop the strip malls and empty fields?